wow!!! I love birds, yet, Devorah this would be a very loud sound to have so nearby. I am a birdy nerdy. I love birds. Great to hear..... pun intended. 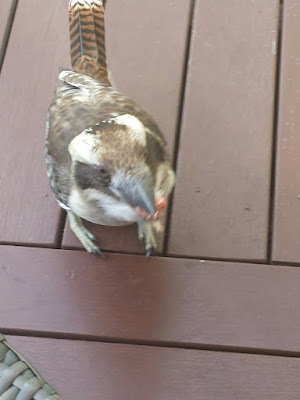 We have 7 kookaburras that we hand feed on our back patio every day. We have one special one we call Jack because he has one eye. They are special and sometimes they give us a floor show face to face. We are also visited and feed Magpies, Kurrawongs, Butcher Birds, Pee Wees and Mynas. Joe: what are you feeding them? 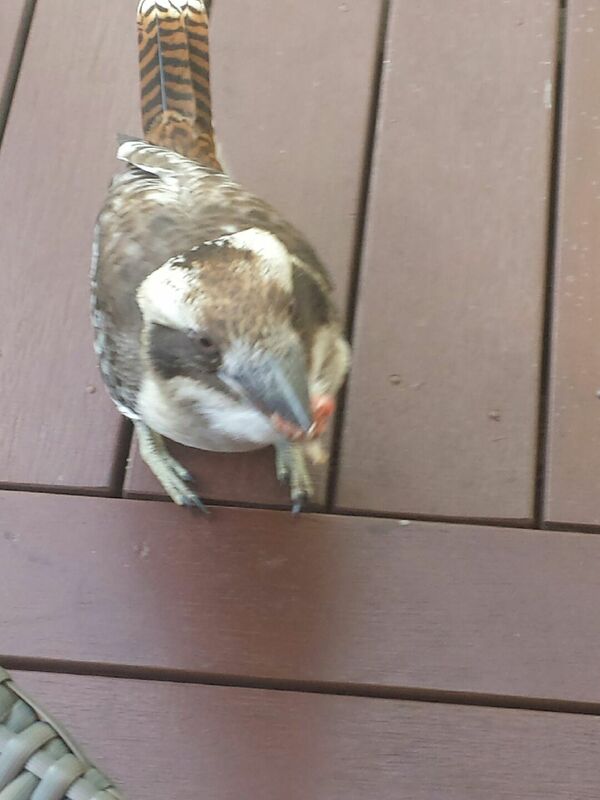 I have magpies and mynahs and lorikeets but I've never fed a kookaburra, what's the secret ingredient? Minced meat is the favourite as is for Magpies and Myhahs. Lorikeets are fruits and berries. Oooooh, Joe and Devorah I'm so jealous!!! The Lord,Gd made them all." Thanks so much for sharing... after nearly a month of sadness and crying at the passing away of my sister, this sweet Kookaburra, made me laugh. thank yo Devorah.. just for you to read. post pics if you have!!!! Stella, sorry to hear about your sister. We all wish you long life. Leah: Joe sent me a couple of photos, I put one of them up in the blog post. Ohhhhhhh it's so beautiful!!!! That must be so awesome to be so close to this beautiful creature and to feed him mince meat! Wow! You made my day! Thanks Devorah and Joe!